B&B in Bruges on a ship. Something else for a change. 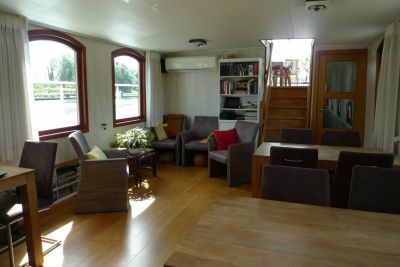 Stay in Bruges at a unique location: a confortable room on a converted cargo ship. 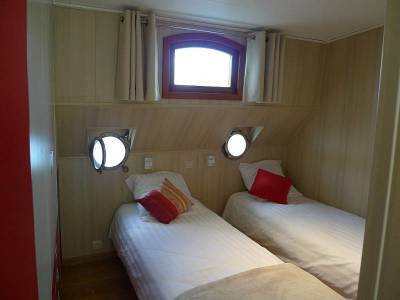 The motorship Johanna has been converted in 2013 into a 3 room cruise ship, each room with ensuite bathroom. 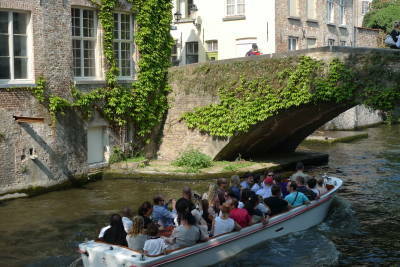 While cruising in France during summer, we offer a cosy B&B in Bruges during our off-season. Our B&B Barge Johanna is moored on the canal near the Katelijnepoort, on walking distance of the historic center of Bruges. It’s only 600m from the train station, 500m from the Beguinage and 1200m from the market square and Burg. For those whishing to explore the area further away, e.g. to Damme, we offer bikes for rent. We transformed the ship’s interior in a contemporary and modern style. The result in an open and airy space with outside view everywhere. 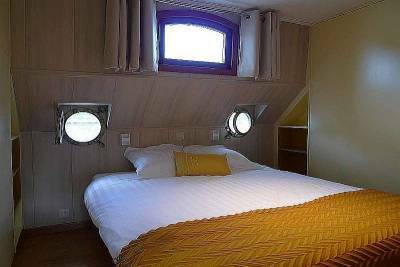 Even in the rooms, the portholes give you a view on the water. There is central heating, airconditioning and forced ventilation everywhere. Guests are welcome in our living area for a coffee or tea or just for a talk or reading a book. A selection of games are also available. Our guest rooms are functional with lots of storage room, ensuite bathroom with shower, sink and toilet. All rooms have a small safe. Hair dryer and towels are provided. The yellow “summer” room has a queen size bed. The green “spring” room and red “autumn” room have 2 single beds that can be put together with double bed covers. Price "all-in" per room (1 or 2 pers. ): room, stay, breakfast, city tax, free WiFi.